In order last year having been active and to stop with atelier advancealmost Shino calcining after one year. As for Shino, It is very difficult work that has many hurdles with the high process stand from making the ground to completion. Firing about 100 hours and use butane gas with this one time approximately 500kg (cylinder 10 of one 50kg consumption). While applying this much time and labor, one kiln total destruction reaches to the quantity of already innumerable extent, can put out the standard marks and cannot declare about it directs to Shino understanding 18 year repeating wretched yield rate, reaching up to today and continues to learn intently. In order the latest works of 3, in the White Snow Shino Tea bowl to make the mellow forum be prominent, it tried squeezing the tatami mat attaching to the utmost thinly. This kind of hillock making is new attempt. 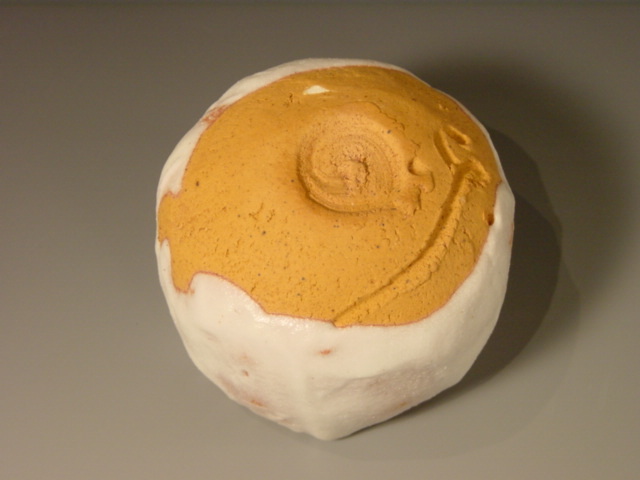 As for Shino of 2 which this time are published, I have named "HAKUSETSU (White Snow Shino)" with my individual and orifinal ones where you can not see the disposition glaze pitch in the other Shino potters. The pure white profound material feeling and like the snow the color tone is designated as the feature. Ash-glaze vase was painted with Shino-glaze and Ash-glaze and inserts in mould and buries the opening with the charcoal and burning it with the Shino kiln. That color tone differs to the degree of fire kiln. That is the exciting moment of unloading of kiln.